If you don't organize your computer files, your computer can become a nightmare of electronic clutter fast! It doesn't have to be this way. 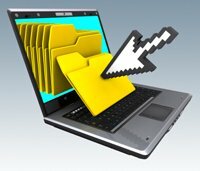 Simply think about decluttering the computer files and e-mail the same as you would paper. Let's get busy on your computer cleanup! First let's organize computer files then move onto organize e-mails. So, you'll want to first declutter by deleting any electronic files you don't need. Second categorize and organize what's left over. The process for organizing a computer is pretty much the same as organizing paperwork. Look at the main categories of your work and create electronic folders. Then break these down into further sub-categories and create sub folders which will fit into your main electronic folders. Then simply place your electronic files in the appropriate folder and you're done! Now onto organizing your e-mails. You'll organize these much the same way you organize computer files. Create folders for each of the main categories of your work. Weed through your e-mails and delete those you don't need and file the rest in the appropriate folder. To maintain this system of organization, delete e-mails as they come in if you don't need them, or file in the appropriate folder. Be sure to go through all your folders and delete any e-mails that you absolutely don't need on a regular basis, say every few months. Remember, the more you utilize your folders to organize e-mails and delete any unnecessary e-mails as they come in, the less you will have to go through your folders. Organize e-mails as they come in and you'll have a cleaned up e-mail in no time! Go to the "My Computer"
Right click on your "C"
Your system will check for items that are safe to be removed and you'll be asked if you'd like to delete them. Click "Ok" to delete them, and your system will do the rest. Now it's time to defrag your computer. It's a good idea to defrag your computer every week or so. Defragmentation happens when you move and or delete files like you did above when you organized your computer files. To defrag your computer you will need to go to "My Computer" again and right click on your "C" drive. Click on "Properties", Click on "Tools", then click on "Defrag Now" and you're done. Remember you'll want to perform these steps periodically to keep your computer system clean and defrag it to keep it in top running order. Congratulations, you've learned how to organize computer files and maintain a system of organization that will pay itself back in time saved!